Operation Thailand: PJ and Joe's wedding(s)!!! So. I am friends with Joe. I am friends with PJ. These are the facts. Joe and PJ worked at the school I work at now and are moving to Abu Dhabi this week. 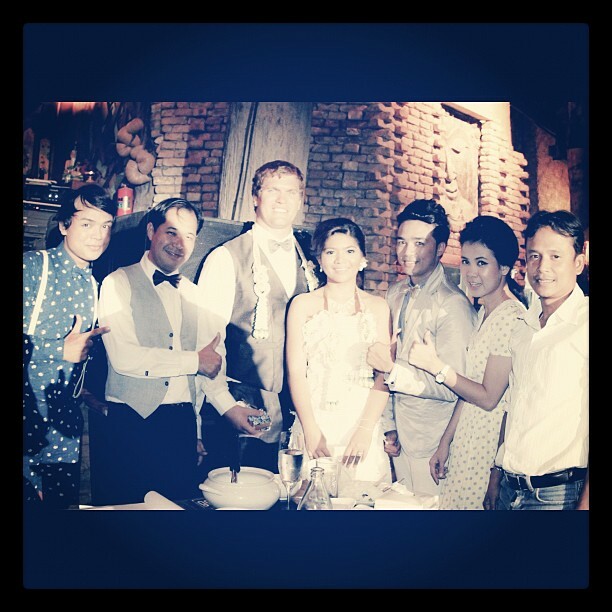 PJ is Thai, Joe is from America. More facts. They had two ceremonies last Monday. One a traditional Buddhist ceremony early Monday morning and a traditional Catholic wedding in the afternoon. 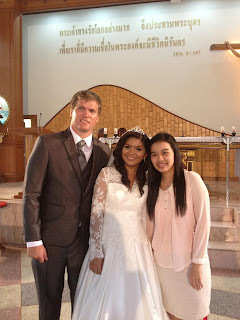 I have never been to a Thai wedding, was an event I really wanted to experience while in Thailand and was very grateful to both of them for letting me tag along in both ceremonies. I will do my best to explain. The Buddhist ceremony in my opinion was the highlight of the day. PJ graciously let me and Mare be a part of it. Last Sunday, I met up with PJ, Joe and Joe's family at the wedding shop to get fitted for the costume for the next day. Jacket fit great but had to wait until the next day to put on the pants. I use the term pants very "loosely". (Loosely, like pants are loose sometimes?? ahh nevermind) It was more like a very beautiful fabric that needs to be put on in a very specific way. It involves knot tying, going underneath your legs, a belt and looking a tad like Aladdin. I asked PJ what time she would like me at her hotel the next morning? : 5:30am. So I got get shaved by my barber, set my alarm for 5am and get fairly excited of a day of love that was about to transpire. Get to their hotel at 5:34am, right when Mare got there. The girls were getting their hair done by some Thai lady-boys. The men were on our own to figure out how to tie our own pants up. Luckily one of Joe's brothers was paying attention at the fitting and MacGyvered our way into looking fabuthai! (ha!!) Drove to school in my amazing Thai costume, signed in at school and went to the ceremony. Actually got stared at less driving because I resembled a real Thai person. In retrospect, I should have gone to our new McDonald's and ate a delicious (former grade 3 spelling word) breakfast. A hungry Bert is not a friendly Bert but I managed to power through it. I'm growing up. I will do my best to sum up my perspective of the Buddhist ceremony. I obviously will not do it justice and probably didn't understand most of it. I got their around 6:55am, about 15 minutes before everyone else because I am very punctual and reliable (see growing up remark above). Once the wedding party got there we had to wait for 5 monks to show up. August 20th was picked by monks as a lucky day and more specifically 9:09. 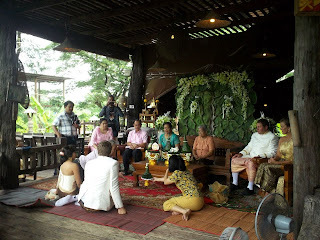 Once the monks showed up, PJ and Joe sat down on the ground while Joe's family, a few other Thai people, Mare and I looked on as they chanted somewhat rhythmically while blessing a white piece of string. This lasted about 5 minutes, after the monks were finished, a few more blessings and respectful offerings were given, the monks were given food. After that, very traditionally, DJ Phopon drove the monks back to the temple in his car. It was now closer to 8:30, Joe's and his family left and were instructed to come back to the ceremony, leaving where they were at 9:09 for good luck. Very superstitious and exciting. August 20th was a very popular day to have a wedding so the streets were busy with brides, grooms and monks. Just before the wedding party arrived, firecrackers were set off so scare away evil spirits. I'm not going to lie, it startled me but does make sense because I wouldn't want evil spirits around for my wedding, would you? Joe's big family arrives in a single file, all holding offerings and gifts. PJ is in a back room and Thai tradition is the groom has to go through gates of people, professing his love for PJ and bribing the gate keepers to let him pass. Mare and I are holding flowers and garland and acting as gatekeepers. Instructions were to make Joe profess his love loudly for PJ, why he loves her and so on. This was very cool. Joe gets to the gate and Mare and I make him tell us why he loves her. His answer: "She is a good time". I agree. He tells us how beautiful she is, why he loves her and make him repeat it louder so that she can hear. After about two minutes of this, Mare and I were satisfied with what we have heard, take his bribe and let him through. Only close friends, family and some employees from the school were invited to the morning ceremony. I would say in total about maybe 30 people were there including Joe's pretty large family, PJ's family, some other Thai people I do not know, a very cute baby, the Director, his wife and other higher up people at my school. Offerings were given, a lot of Y ing took place, gifts were given to PJ's mother and to Joe's mother. Joe and PJ were sitting on their knees the entire time while the people involved in the ceremony were sitting on chairs. There was a Thai man speaking in Thai, I'm assuming very nice things about Joe and PJ, there were two other Thai people helping out with telling Joe and PJ when to Y, where to sit, who to give what to. A lot of procedures to cover so makes sense having experience and a translator. 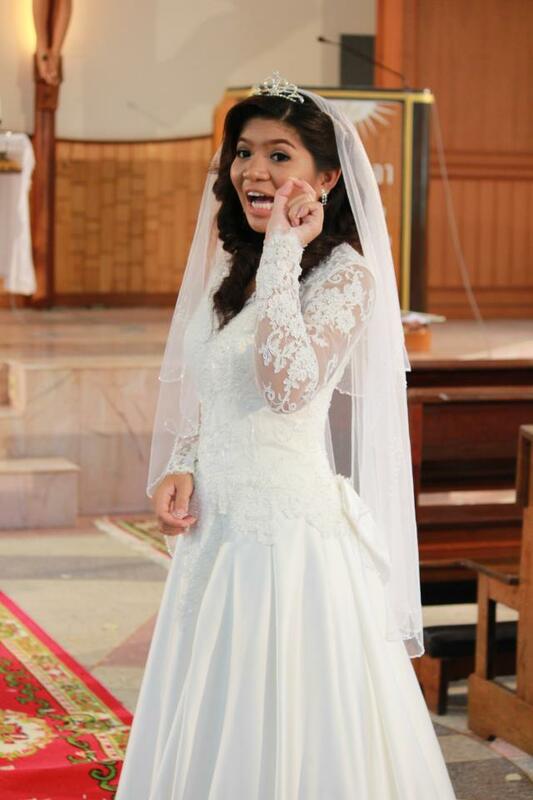 In traditional Thai culture and other cultures around the world, a dowry is given to the brides parents. I know that now it is a little less common and sometimes just for show. Essentially, a dowry is a reward for the parents for raising such a beautiful and well rounded daughter, which PJ certainly is. Unclear how that worked in this situation. Next step was blessings to be given to PJ and Joe by every person in attendance at the wedding. This I was unaware of but was the highlight of my day. PJ and Joe are sitting down on 2 separate chairs, arms folder over a chair with their arms bent and hands cupped together with a little space in between them. Then our Director put the string that the monks blessed around Joe and PJ's head which was attached to something that resembles a halo but fits on your head. So they are joined by this blessed halo/string to symbolize how connected they now are. Each person takes a turn with a beautiful ladle filled with blessed water and pours a small amount into Joe and PJ's hands with the water falling into a small basin that had gorgeous flowers in it. I was asked to stand up and pour water into their hands next. I found this quite exciting. While pouring water into PJ's hand, she tells me I need to say a blessing. Well, apparently I don't listen when my mom sent me to church the first 13 years of my life so the best thing I could say was "PJ, you are very beautiful and I hope you have very cute kids". Could have gone worse. Regrouped and told Joe "Be nice to PJ". I'd say solid effort. After everyone had blessed them and given them blessings of actual use, pictures were taken like a typical Western wedding, snuck my way into a few of those. 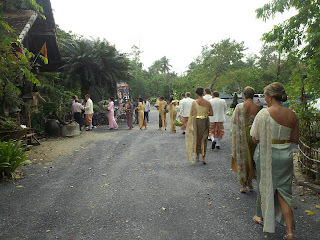 Then that was it, first Buddhist Thai wedding in the books. Very fascinating to observe a different way of getting married and different traditions and customs. Very grateful and appreciative to Joe and PJ for letting me come to both of their ceremonies and reception. At 4pm was a traditional Catholic wedding with about 35 people at and it poured down rain 15 minutes before the wedding so I don't think I could have been more wet walking into that church. 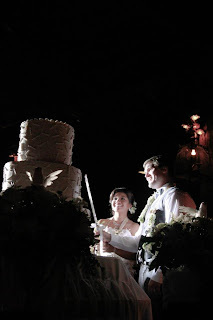 After that the reception had about 350ish people there, food was served, slideshows of Joe and PJ were put up, still not sure if the cake was real or not. A lot of Thai people I did not know, a lot of my current students were there because PJ was there Thai teacher last year. Overall great day that went by very fast and just kept thinking how much Stu, Kait, Emma, Jake and their other close friends would have loved to have witnessed it. Good luck Joe and PJ with life in Abu Dhabi.